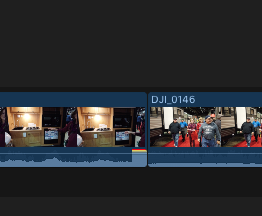 It would seem I&apos;m getting a lot of audio spikes at the end of my Osmo Pocket clips. I don&apos;t believe I&apos;m hitting the button particulary hard, or the record circle on the Mimo app. I don&apos;t see this on every clip, but on enough of them that they&apos;re making post processing more challenging than it needs to be. Anyone else seeing something like this? See the timeline screenshot below. Hi there, thank you for reaching out and we&apos;re sorry for the trouble. With regards to that may I ask. How often do you receive that kind of issue? And have you check as well if there&apos;s a sound being recorded on the end part of the clip? Please keep us posted. Thanks! It happens about 40% of the time. Yes, there is a sound, but it&apos;s not the sound I was recording. It resembles the sound you get when you&apos;re connecting/disconnecting speaker wires to a stereo. Kind of a "Pffffttttt!" sound - sometimes soft, sometimes LOUD. At first I thought I was recording the sound of me pressing the record/stop button, but I occasionally get this sound when I&apos;m using the Mimo app, and stopping the recording on my iPhone. Thank you for providing this information may I ask as well if this only happens when using an Adapter to the device? And what about when using the WIFI module are you able to experience it as well? However, I will forward this to our developer and for us to have feedback, then once I have the feedback will reach back to you. Thanks! "An adapter"? What do you mean by this? What adapter? Plus, I don&apos;t have an WiFi/Wireless module, so I can&apos;t say. Ok, I apologize. I mean the one that you use connecting the Osmo pocket to your Device. By the way what mobile device are you using? Oh, ok. I&apos;m using an iPhone 6. Yes, I was using an adapter to connect to my iPhone for most of the clips that had issues. Does this add a potential source of noise when ending a clip? Plus, it didn&apos;t add this noise for all the clips, even while using the adapter, which is puzzling. Ok, thank you. Actually one of the conclusions behind this would be when hitting the stop button. However. It will be great if you were able to provide at least the last part of the video showing the issue for our developer to analyze as well you may just upload it from Dropbox, google drive or any. Then share the link here. Thank you. Hey I have the same issue with this. For me it happened every time no matter it&apos;s 4K in any fps (I tested it all) or 1080P(Just tested for 60P). Every time I record over around 5:13, it will split into a separated file which remains around 4.9GB/file. If my video it&apos;s 6 minutes it definitely splits it into 2 different files and it always happened at the end of the first clip. Please fix it on the next firmware update. Well, this is not at all the issue I&apos;m experiencing, but good luck!